By Cormac Byrne | October 23, 2017. 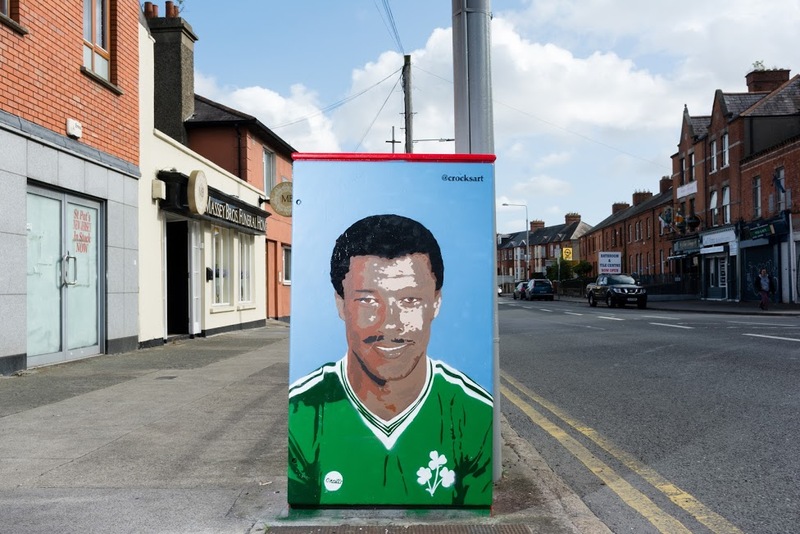 A superb mural depicting St. Patrick’s Athletic legend Paul McGrath has popped up in Inchicore. McGrath, who made his professional debut for the Richmond Park outfit in 1981, went on to win 83 caps for the Republic of Ireland, and is regarded as one of the country’s greatest players. 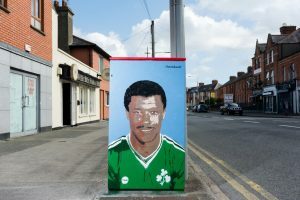 The rugged centre-half, who was nicknamed the ‘The Black Pearl of Inchicore’, racked up four goals in thirty-three appearances for the Saint’s and at the age of 22, won the PFAI Player of the Year award in ’81. The now 57-year-old left Inchicore in ’82 and moved to Manchester United, where he won the FA Cup in 1985. The street artist Cathal Craughwell has paid tribute to one of Inchicore’s finest sons with this fantastic mural (pictured above). The painting is located on Emmet Road – just a few hundred yards from the Saints’ home ground at Richmond Park. Pat’s could use someone of McGrath’s stature this season. The Saints are currently locked in a relegation battle, with only a point separating themselves from tenth position. Liam Buckley’s side face Cork City on Friday night, before finishing their season with a tough journey to take on Derry.